Putri Bali Hotel is set on a wide stretch of beach right at the heart of Nusa Dua, Bali's premier resort, only 7 miles or 20 minutes from Bali's International Airport. Ideally situated on a large seaside property 90,000 sq.m of ground facing the magnificent Nusa Dua Bay. The extensive gardens, landscaped around the original established trees, stretch right down to the best beach on the entire peninsula, perfect for swimmers and water sports lovers at both high and low tides. The rhythms of Balinese life in the local community are echoed within the hotel, which as the name Putri (Princess) suggest assures you of a "royal" Bali experience. Hotel Putri Bali offers the perfect combination of international facilities and charming Balinese hospitality to complement your holiday. 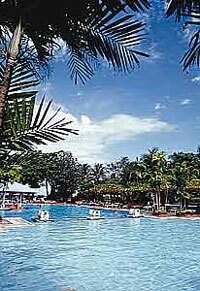 The large outdoor pool with its sunken bar attracts most guests to cool off during the heat of the day. The 384 rooms are large; include 21 cottages in typical Balinese d�cor with individually controlled air conditioning, balcony, IDD phone, radio, music, TV with in house video and mini bar. 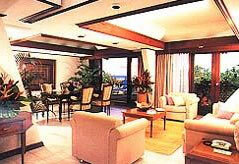 Well-appointed and comfortably furnished with luxurious simplicity overlooking the vast gardens to the sea. Leisure and pleasure are made easy at Putri Bali. Unique to Putri Bali is the opportunity to join in with our cultural activities. It's fun for all and provides an insight to traditional Balinese arts and crafts. The large outdoor pool with its sunken bar attracts most guests to cool off during the heat of the day. 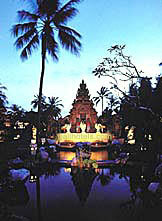 Guests are encouraged to join in with traditional activities, and experience true Balinese culture. Choose from a lavish, buffet or a wide selection of International delights a la carte at our restaurant - Semeru Rotisserie, Taman Tirta Cafe Restaurant, Samudra Seafood Restaurant, Ambara Open Stage - traditional Indonesia buffet style dinner with fantastic Balinese dance and gamelan orchestra, Beach Club, Paseban Bar, Samudra Pool Bar. An Ideal location for any occasion, from an international conference to your most intimate party, 6 convention halls, seating from 15 to 400 persons, with complete range of meeting facilities. Shopping Arcade, Bank, Travel Agent, Money Changer, Beauty Salon, Drugstore, Post Office, Tennis Courts, Squash, Water Sports, Sightseeing, Massage, Sauna, Fitness Canter and Fun Club For Children. (Earlier check in is based on room availability).